Editor's note: Rep. Charles Rangel (D-New York) is a member of the U.S. Congress. Hugh Evans is CEO of The Global Poverty Project. The views expressed are their own. (CNN) -- Toilet, latrine, loo, washroom, baño, water closet, toilette -- no matter what you might call it, toilets are a basic tool for sanitation. And in many countries, access to one is taken as a given. But not for the 1.1 billion people who have to defecate in the open. 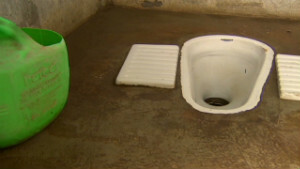 Men, women and children who are left to face conditions that are unsanitary, sometimes dangerous and often humiliating. So what if we told you the United States could help address the problem? And that there is actually bipartisan (yes, you read that right) legislation on the table? Because there is -- and the U.S. Congress has a unique opportunity to continue this leadership by investing in increased access to water and sanitation around the world. More than a hundred members of Congress have crossed the aisles and joined co-sponsors Reps. Earl Blumenauer (D-Oregon) and Ted Poe (R-Texas) to champion the Water for the World Act. And they are joined by over 80 civil society organizations that have raised their voices to support the bill. If passed, the Water for the World Act -- which moved through the Senate Foreign Relations Committee on Thursday -- would help improve the lives of 2.5 billion people who live without a basic latrine. How? By ensuring funding for water programs get to the communities with the greatest need, a key step in addressing these critical issues, while making one of the best investments the United States can make. The lack of access to water and sanitation is a global problem that impacts health and economic development for all. Consider this: In many parts of the world, girls and women are disproportionately expected to find water, with many facing treks of several hours to a stream and back across often unsafe terrain. This can affect girls' ability to participate in the classroom, if they have time to attend at all. And for girls that attend schools that do not have private bathrooms, the cultural shame and embarrassment of menstruation more often than not pushes them to drop out. This is a major loss to the local community, because when women and girls have the tools they need to provide a healthier life for their families through education, it has a tremendous ripple effect across all areas of local development. Now is the time for Congress to act by helping the United States support other nations in the global effort to provide access to clean water and sanitation worldwide. The results could be dramatic. Just look at Ghana, where by the end of 2015 it is expected that less than 5% of people living in the five most affected regions of that country will be practicing open defecation, while more than half of them will be using improved toilet or latrine facilities. The Ghanaian government is looking to increase access to water and sanitation across the country with a goal of ensuring more than three quarters of Ghanaians have access to safe drinking water, an advance that would help keep waterborne diseases at bay. This is the kind of plan the United States should be behind, and it is the sort of progress that should be celebrated and recognized by donor countries around the world, not least because future significant advances require the support of key donor countries like the United States and Britain. So, will Congress respond? The finish line is within reach -- and we cannot afford to stop short by failing to pass the legislation before the end of this congressional session. By passing this bill, Congress would be sending a powerful statement that it is committed to the post-2015 development agenda, and helping hundreds of millions of people around the globe who lack clean water and sanitation. Because the reality is that no matter what you call it, a toilet can mean the difference between life or death.